Rub the chicken with the lime juice. Mix together garlic, salt and pepper and rub all over the chicken including the cavity. Place in a pan and roast in the preheated oven for about 1 hour or until tender. Meanwhile make the rose petal sauce. Place rose petals and plums in a blender and blend until smooth. Leave in blender and set aside. Bring the 2 cups of water to a boil and while that is being done, cut an X on the flat end of each chesnut with a knife. Toast the chestnuts with a knife. Toast the chestnuts in a hot cast iron skillet for 5 minutes. When the shells of the chestnuts open, add the chestnuts to the boiling water for 15 minutes. Drain chestnuts and allow to cool. Peel chestnuts. Add chestnuts to the roast petal mixture, and puree while gradually adding the remaing 1 cup water. Reheat the skillet and melt the butter saute garlic then add the rose petal puree. Simmer for 10 minutes then whisk in the honey, salt and pepper. Pass the sauce through a sleve into a clean pan, pressing on the solids to extract the juice and some chestnut pulp. Keep the sauce warm. When the chicken is done, place this on a serving platter. 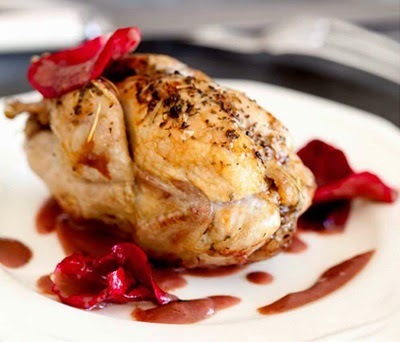 Serve the chicken with the rose petal sauce poured over it or placed in a bowl on the side.